Traversing the jungles of Chult can be a harrowing experience, even without a death curse hanging over your head. Don’t go without a good set of dice at your side. Includes 1d20, 1d12, 2d10, 1d8, 4d6, 1d4. 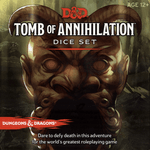 Jade-green dice in custom-cut foam inside a metal container (lid embossed with the Tomb of Horrors/Tomb of Annihilation devil face) and wrapped with a paper slipcover.